What started as an ambitious digitalswitzerland bet by foraus – Swiss Forum on Foreign Policy and the Digital Society Initiative of the University of Zurich – to solve pressing global issues collaboratively with a global ‘crowdsourced think tank’ – has left the prototype stage. foraus and the Engagement Migros development fund launched the pioneering platform Policy Kitchen on 15 September 2018 in Lausanne, with a pilot campaign to tackle global loss of biodiversity. Policy Kitchen is a crowd-innovation platform, which enables a diverse network of thinkers and practitioners from all over Switzerland and the world to co-create solutions for global political challenges. The platform is open for everyone and uses the power of collective intelligence; it provides the users with the opportunity to develop constructive solutions outside established political mechanisms. The software is made available to the public as open source code, to support other actors in adopting participative methods in their respective fields. The model is now tested in the real world, with a digital campaign and workshops in 7 cities in Switzerland, Liechtenstein and Germany (public and free, sign up here). In future iterations, it will be extended to the foraus global network of open think tanks and additional partners. New challenges are already in the pipeline, for example on exploring the potential for an AI strategy for Switzerland (in partnership with swissnex San Francisco). Policy Kitchen’s first campaign focuses on biodiversity preservation. Ecosystem decline is among the biggest threats for the survival of mankind. It is a highly complex global issue that is marginalized in the political agenda. The campaign aspires to stimulate solutions with a focus on global governance, trade policy and development cooperation. 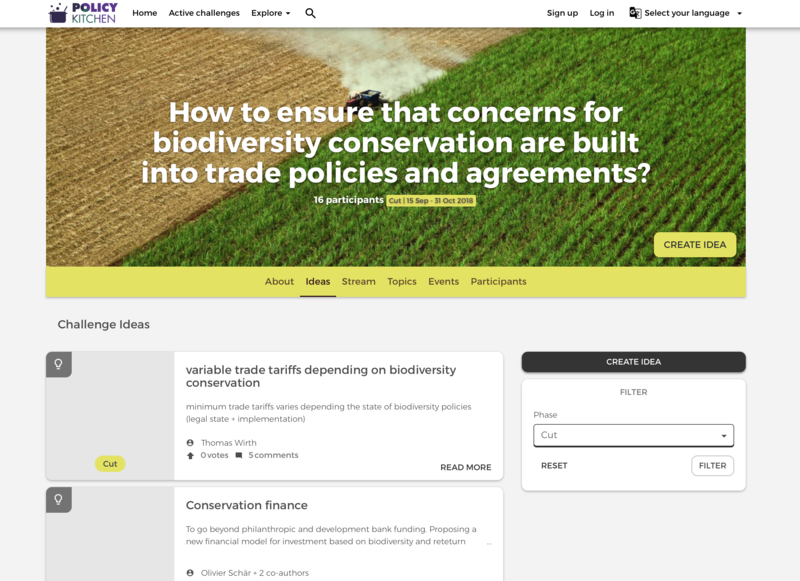 Ideas for this first challenge can be submitted onto the platform by everyone until 31 October 2018, where they are later refined, selected and converted by the platform users as well as experts into clear – cut “Policy Recipes”. The project is supported by Engagement Migros. Alexandra Müller-Crepon, project manager of Engagement Migros, is proud that the development fund is the main supporter of this project: «Policy Kitchen is a project that utilises digital innovation for finding solutions to global challenges. The platform is original, bottom-up and society-driven. It is a model for future policy making.» Policy Kitchen is a three – year project with the aim of creating impact on policy-making and collaboration in Switzerland and abroad. If you are interested in more updates on the digitalswitzerland challenge, remember to sign up to our newsletter! The post Digitalswitzerland Challenge Bet sees the light of day: Policy Kitchen is now live appeared first on digitalswitzerland. Next3 pieces of cake: It’s digitalswitzerland’s birthday!